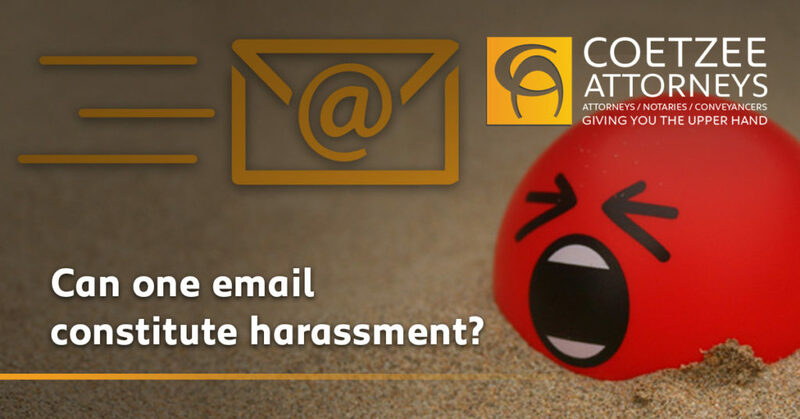 Email Harassment - Contact Coetzee Attorneys - Legal advise. In terms of the Protection from Harassment Act, 2011 (“the Act”), harassment is seen as conduct that takes place repetitively over a period of time to constitute harassment. However, our courts have recently held that for a victim to be granted protection under the Act, the conduct need not be repetitive in nature and that a victim would be entitled to protection if a single act was of such an overwhelmingly oppressive nature, that it would have the same effect on the victim as to a victim experiencing protracted harassment. The Act’s definition of harassment includes conduct that a perpetrator knows or ought to know will cause harm, which means any mental, psychological or economic harm or inspires the reasonable belief on the part of the victim that harm will be caused to the victim or any member of his/her family. This can include (but is even wider) unreasonably following, watching, pursuing a person, unreasonable verbal, electronic or other communication and or unreasonable sending of letters, faxes, telegrams, packages, text messages and / or emails to a person, as well as sexual harassment and bullying. Under the Act, a victim can relatively informal and cost effectively obtain a protection order and enforce such against a perpetrator and have such formally served on them. The Act, unlike the Domestic Violence Act, does not require a “domestic relationship” between the complainant and the perpetrator. In your situation, the single email of your colleague could constitute harassment under the Act and allow you to consider the remedies afforded under the Act. It would be prudent to consult your attorney to discuss the merits and various options available to you to address the conduct of your colleague before you take any steps.